John Dewey's new biography — the first in English, and one of the most comprehensive to date in any language — has now been published by Brimstone Press. Providing a long overdue introduction to this major figure, it tells the story of a fascinating life and personality as reflected in the poems, presented here in the author's own verse translations. Written with the general reader in mind, the book also makes important new contributions in the field of Tyutchev studies. For its account of Tyutchev's life it draws on an extensive range of sources, including much previously unpublished archival material. Datings, addressees and circumstances of composition are established for a number of the poems which have hitherto proved problematic in this respect. Tyutchev's poems, and his relationship to the major intellectual and political movements of his age, are subjected to detailed analysis and reassessment. Mirror of the Soul has been acclaimed by the critics as a major new work in its field (see below). JOHN DEWEY has degrees in languages from the Universities of Cambridge and Nottingham, and for many years taught German and Russian in schools and colleges. His previous publications include translations of Russian poems, verse and prose, and articles on Russian literature. 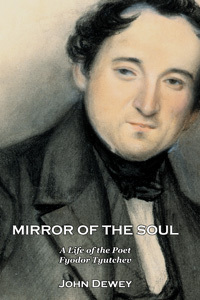 Mirror of the Soul is no longer in print, but may be downloaded free of charge as an e-book here.